If you’ve been a visitor of Work-At-Home Success for some time, you’ll know that I’ve never been very optimistic about making a living doing surveys. It’s not that you can’t make money, but I don’t believe you can make steady, regular income needed to pay the rent. However, if you’re looking to supplement your income or earn mad money, surveys can be a fun way to do that. Here are a few survey companies you can check out if you’re interested in learning more about surveys. Companies need information and feedback on the products and services they sell. They get this feedback by asking consumers questions about the product specifically or their buying habits in general. Surveys are not new, but in the past they came in the mail. Today, you can do surveys online or through mobile apps. No, at least not the legitimate ones. Like most everything else related to working at home, there are always a few bad apples trying to take advantage of others. Legitimate survey sites do not charge money. I have found that some sites will charge money to access their database of survey sites. You have to decide for yourself whether this is worth it. In my experience a little research goes a long way. And some of these pay-for-access survey database sites sneak in free-to-try programs that can cost you money. Here are few survey sites you can try. They are free, BUT I cannot make any guarantees about their programs or your success in working with them. They are offered solely as information you can check out. Note that some of these pay in giftcards. Some of the above survey sites above may pay an affiliate commission if you register. Hello – There are tons and tons of ways to work from home. Many of the different ideas and opportunities are posted here at Work-At-Home Success which is free to use. You can visit the survey sites listed in this article and sign up. They are free. Again, you won’t make a lot of money, but you can get free stuff and a little mad money. I HAVE ACTUALLY MADE SOME MONEY DOING SURVEYS FOR MYSURVEYS, TOLUNA, LIGHTSPEED PANEL, INBOXDOLLARS,OPINION OUTPOST,EPOLL,AND VALUED OPINIONS TO NAME A FEW. 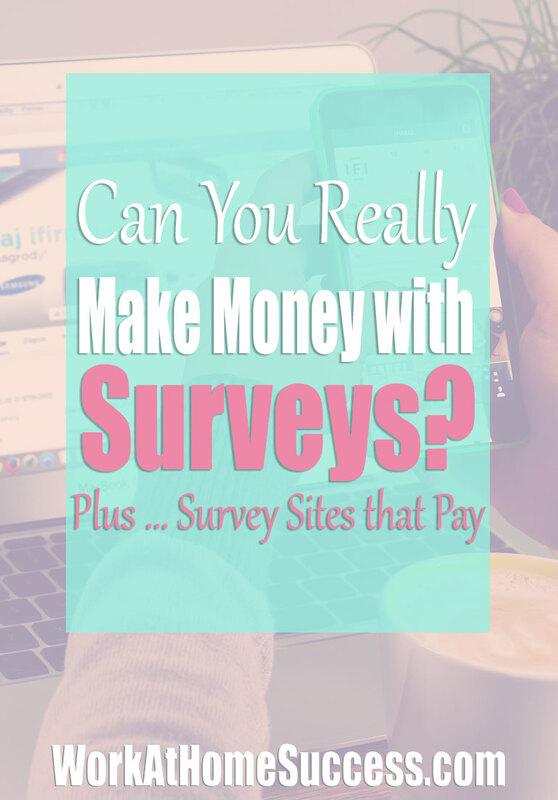 YOU DON’T MAKE ALOT OF MONEY, BUT I HAVE ABOUT $120 COMING FROM A FEW OF THESE SURVEY SITES ADDED TOGETHER. IT TAKES A LITTLE WHILE TO BUILD UP ENOUGH POINTS TO REDEEM FOR CASH, BUT I THINK IT IS WORTH IT, AS THE SURVEYS ARE GENERALLY VERY EASY AND FUN TO DO. SOME OF THEM LET YOU TEST PRODUCTS FOR POINTS THAT YOU CAN REDEEM, SO YOU ARE ALSO SAVING MONEY BY NOT HAVING TO BUY THAT PARTICULAR PRODUCT. I HAVE BEEN DOING THIS FOR OVER 5 YEARS AND I FIND THAT THE PAYOFF IS DEFINITELY WORTH THE SMALL AMOUNT OF TIME THAT IT TAKES TO DO THE SURVEYS AND TEST PRODUCTS. SOME OF THEM JUST REQUIRE AS LITTLE AS CLICKING ON AN EMAIL AND READING IT. WHAT COULD BE EASIER THAN THAT? THEY ONLY GIVE YOU A FEW CENTS FOR EACH EMAIL THAT YOU READ, BUT IT DOES ADD UP IN TIME. Hi Terry, Thank you for sharing your input! I agree that it can be fun to get free things. But many survey companies make it sound like you can make big bucks and that just isn’t the case. Thanks again! I have read your blog and I find this article to be okay. Just wanted to let you and everyone else know that you can’t make a living doing surveys. I’ve been doing surveys for about eight years and I didn’t make no money. All the survey sites that I’ve join was point base for redemption for gift cards or other worthless items. There are secret survey that are invite only and they do pay you alot with amazon gift card or payout with cash. Now, if your talking about focus groups, they do pay from 5 dollars and up depending on what company you sign up for and what type of surveys that are available to you. Hi Jenise, I agree that it’s not possible to make a living doing surveys, but for free gifts and mad money, it can be fun. Everyone I know who earns regularly from surveys belongs to a ton of survey sites. At some point, the return on the effort doesn’t seem worth it to me. You can get paid more in less time with a job or business. Thank you for sharing your experience.